Remove the skin from Mango and cut it into medium size pieces. Put it in a mixie and grind to a fine paste. The paste should be one to one and half cups. The given ingredients are for one and half cup mango pulp. If you use more or less pulp, accordingly increase or decrease the quantity of other ingredients. In a kadai put the rawa and fry till it is hot to touch. Cool it and grind to a fine powder. Also grind the sugar into a fine powder. In a thick bottomed vessel, put a tablelspoon of ghee and fry the cashew nuts. Remove and keep it separately. Same vessel add the mango pulp and fry for one to two minutes on low flame. Then add ground rawa and sugar and mix thoroughly. Add ghee little by little and stir continuously till it is thick like halwa and leaves the sides of the vessel. Add fried cashew nuts and cardamom powder. Mix it well and transfer it to a greased plate and level it. Cut it into squares or any other desired shape. Or put the halwa in a greased bowl and serve as it is. hai,nowadays i am not calling my mother for cooking douts,i am simply get into kamalas corner and choose the menu.U are doing a great job.keep it up. It is really a great compliment to me. Thanks a lot. 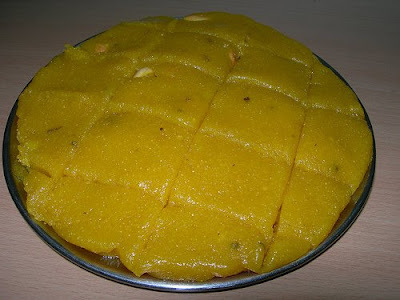 Can I use store bought mango pulp instead of fresh mango.if yes what changes should I make for the recipe. You can use store bought Mango Pulp (not the juice). Before using just taste the pulp and find out whether it is sweet or sour. If it is sour, then increase the sugar quantity. If it is sweet, then follow the above recipe. The consistency of pulp should be thick enough like what we get from the fresh fruit. If it is thinner than the normal pulp, when you are frying, fry it till it become slightly thicker. Try with store bought mango pulp and let me know the result. My first time here. I clicked on Google’s South Indian recipes, and your page came up. I live in the Midwest of the US, and love to cook and eat South Indian food. I am originally from Trichy and have lived here in the States for almost fifty years. Your recipes read very good., I have copied a lot of them and saved them in my documents. We don’t get the mangoes here, (I live in a small town) and so will have to do with canned mango slices or pulp. Thank you for your recipes. You can try with Canned mango. However, the puree should be slightly thick and also it should not be sour. If the puree is thin, then you can fry little besan flour in a teaspoon of ghee and add it to the puree and make it thick. Thank you Kamala for the advise. After I sent you the previous message, a young friend came to visit from Chicago and brought a case of mangos. 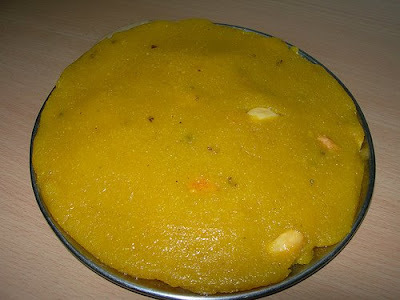 I made the halwa, and thought I would keep it till my husband returned from his travels. Well, he just missed it. I ate it and my friend ate it. It was incredibly good. THANK YOU. Wow. Nice to hear that this halwa turned out good for you.